Jim Klock spent more than a decade as a Stafford County sheriff’s deputy -- and hasn't forgotten his roots. A Virginia sheriff’s deputy who caught the acting bug and made his way to L.A. still looks out for the safety of the residents of Stafford County. Jim Klock spent more than a decade as a Stafford County sheriff’s deputy. While on the job he went back to school. At NOVA Community College, Klock's drama professor noticed his talent. Klock eventually moved to Los Angeles to pursue his new passion. To get by, he worked as Kate Beckinsale's bodyguard. Later, she starred in a film he produced. But his favorite role was playing Peyton Manning’s caddie in a commercial. “No disrespect to anyone I’ve worked with actor-wise, highlight of my career,” he said. Klock said he finds himself missing police work, so he returns to the communities he once patrolled. As a part-time sheriff’s deputy Klock hopes to help at-risk kids through an outreach program he’s developing with longtime friend and boss, Stafford County Sheriff David Decatur. “We're always trying to be creative and think of ways that we can maybe reach different demographics or groups of people who maybe we haven't reached out to yet,” Decatur said. Operation LEAD stands for Law Enforcement Arts Division. 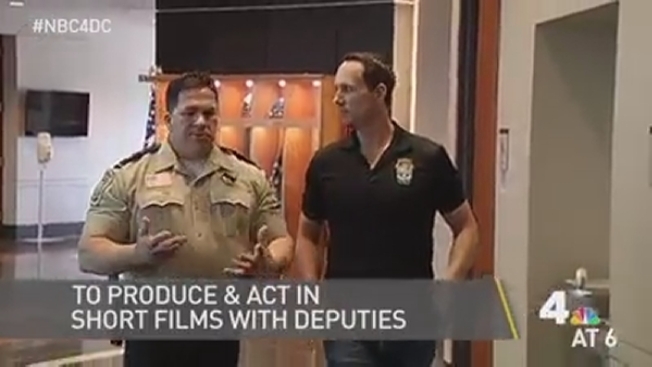 It would give kids a chance to act and produce short films with deputies, hopefully bridging the gap between police and community. “It's the dynamic of how do I marry both worlds together, and I think it's as simple as, How is it to live in your shoes for a minute?" Klock said. Klock said the project helps keep him grounded while working in an industry where it can quickly become all about yourself. “Law enforcement gave me this base that just allows me to settle in to whatever is happening to me and still be grateful,” Klock said. His latest comedy, "6:66 PM: Evil Has an Hour to Kill," is out this fall.